With foreign faces now fairly common on Japanese TV, outlandish performances are by no means a prerequisite for a bit of publicity or prime-time prominence. But it can help. Especially if there’s a generous bit of give and take as far as that all important exposure is concerned. along with tackling the law with one’s tackle out, tops the lot. By all accounts, this unseasonably suited Spaniard initially went for a meander in the moat to retrieve a friend’s bag, but as the video and pictures amply prove, things very quickly got out of hand. Update: The man in question it now seems is not Spanish at all, but a fellow Brit who just happens to live in Spain. A portly, almost Python-esque Imperial predicament that the already embattled Prime Minister Brown could probably do without. Although it may at least bring a brief smile to his almost bovine-like bearing. A British embassy official also confirmed that the man is indeed from the UK, although any details about him were understandably deemed inappropriate. I’ve never enjoyed looking at a naked man quite so much. The Man from Spain Runs Mostly in the Plain. I love that his entire body is shaved! 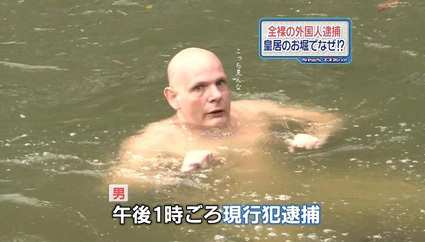 Duncan Goodhew’s let himself go. That guy made my day yesterday..
cor blimey guv, he’s no spaniard, he’s a brit! The only thing missing from that video was a taser. News of the day that was …. great stuff! That was so funny! Certainly, he is a true representative of the British full body, and appears well-endowed too; even after a chilly dip in the moat. What I am now worried about, is well there be revenge incidents by Japanese tourists at Buckingham Palace? Perhaps, a mass naked origami frenzy, during the Changing of the Guard? 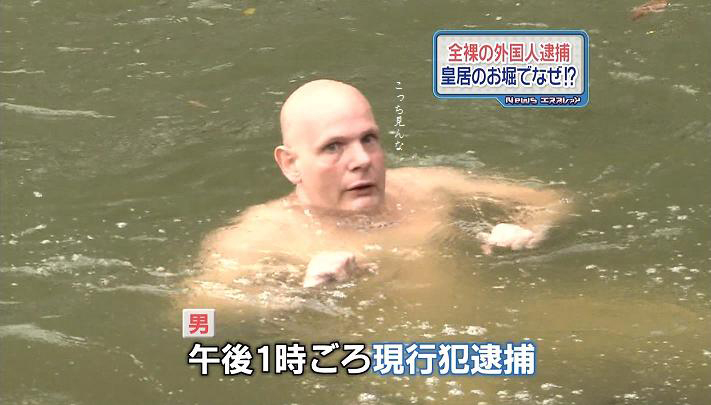 “A 40-year-old British tourist was taken into police custody Tuesday after swimming naked in a moat around the Imperial Palace, police officials said. Hahaha this is awesome. I’m surprised that this is the first time I’d heard of anyone swimming in that moat. The number of times I drove past there wondering if someone would actually jump in there has finally been answered. I thought one of the russian sumo wrestlers had been dipping in the wacky-backy again and flipped out. Its the Amazing Colossal Man! It’s Uncle Fester from the Addams Family! It’s Tor Johnson’s nephew’s mailman! This is payback for Bataan. The Tokyo police officers should be commended on their well balanced response. I remember that a man in LA got shot and killed by a police officer some 28 years ago for similar behavior. Was very clear since the beginning he was not a spaniard. Take a look to his colorless back! And cold face! at least all of us (in Spain) could figure after few seconds he was not spaniard…. poor man…i am sure he has some mental problem.